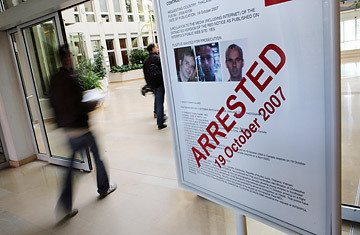 The entrance to the Interpol headquarters in Lyon, France. In early January, two men checked in at Frankfurt Airport for a flight to New York City. They breezed through security after showing their Canadian passports, then settled in quietly for the eight-hour journey. As the plane lifted off, airline officials e-mailed all of the passengers' passport numbers to New York's John F. Kennedy International Airport  a routine measure under U.S. security rules. The alert went out within minutes: the two men were Sri Lankans carrying stolen Canadian passports. When the plane landed in New York, police were waiting there to arrest them.